May 2015 - Touch Display Research, Inc.
May 2015 rumors hold that Apple is developing a larger iPad, or called iPad Pro with improved touch latency. Touch Display Research believes that high conductive touch sensor materials, such as metal mesh and silver nanowire could be good candidates for fast touch response time. We forecast Apple will adopt ITO-replacement within 18 months. By adopting ITO-replacement touch sensors, Apple would be able to raise the touch respond speed, reduce cost and add other new features. This forecast will become true, since we have accurately forecasted Apple’s adoption of AMOLED displays 2 years ago. Detail analysis can be found in the “Touch and Emerging Display Monthly Report”, May 2015 issue. 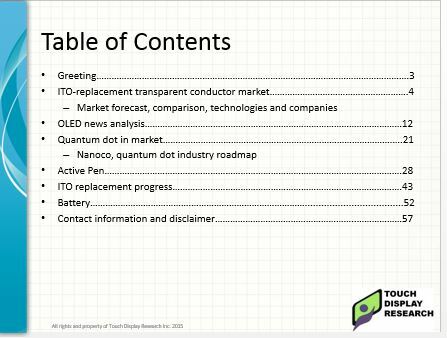 This report also analyzes ITO-replacement, OLED, Quantum Dot, active pen, and battery technologies. 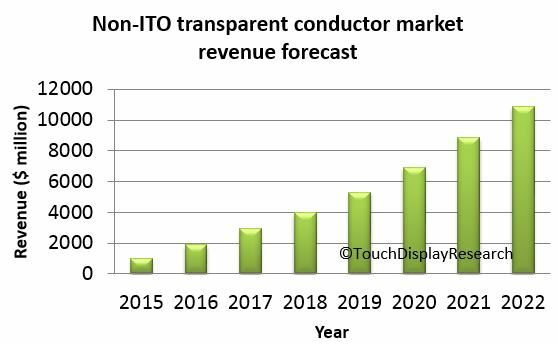 In the ITO replacement: non-ITO transparent conductor 2015 report, Touch Display Research forecasted by 2022, ITO-replacement market will reach $10.9 Billion. This entry was posted in Displays on May 27, 2015 by jennycolegrove. Today, Nissha and C3Nano announced they are partnering to develop silver nanowire type transparent conductor for touch sensor applications. Touch Display Research had a chance to talk to C3Nano’s CEO, Mr. Cliff Morris recently. He indicated being selected by Nissha as a development partner validates C3nano’s position as a performance leader in TCFs. Our survey found that the adoption of silver nanowire and metal mesh are accelerating. 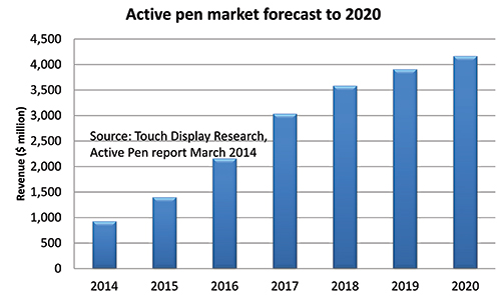 In the newly published ITO-replacement 2015 report, Touch Display Research forecast ITO-replacement market will grow to 10.9 Billion by 2022. Figure. ITO-replacement market forecast 2015 to 2022. Source: Touch Display Research, ITO-replacement report, May 2015. There are 25 companies and research institutes working on silver nanowire transparent conductor currently. Nissha is actually part of another joint venture with Cambrios and TPK on silver nanowire since 2013. More analysis can be found in the Touch and Emerging Display monthly report, May 2015 issue. This entry was posted in Displays, ITO replacement, Touch screens and tagged C3Nano, ITO Replacement, market forecast, NISSHA, silver nanowire, Touch sensor on May 8, 2015 by jennycolegrove.